St. Anthony of Padua, the great miracle worker of the thirteenth century, was preaching at Toulouse, where many heretics denied the Real Presence of Jesus Christ in the Holy Eucharist. One of them challenged him to perform a miracle to prove the Real Presence. St. Anthony asked him: "What miracle do you ask for?" 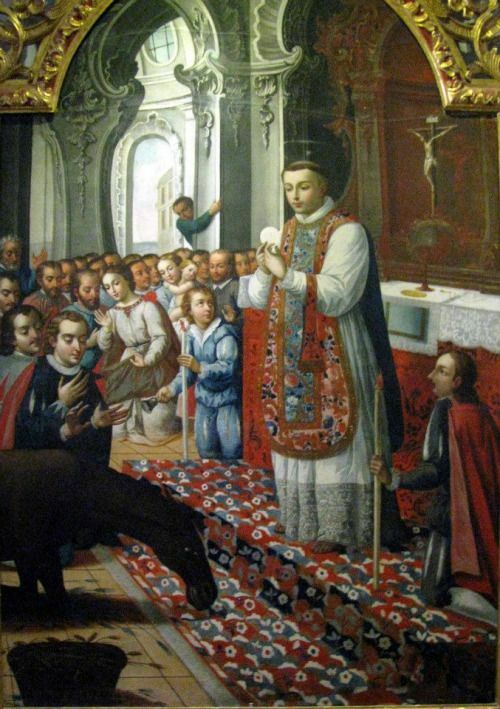 He replied: "I will believe if my mule falls on its knees in presence of what you call the Blessed Sacrament." St. Anthony, inspired by God and trusting in Him, accepted the challenge. At the appointed time he went in solemn procession carrying the Blessed Sacrament, followed by an immense number of people, to the public square in front of the church. The heretic with his mule was there, waiting for him. St. Anthony then spoke thus aloud to the mule: "Creature of God, in the name of thy Creator, whom I hold in my hands, I command thee to kneel down and adore Him." In the meantime, the heretic was tempting the hungry mule to eat a bundle of hay. But the mule, paying no attention to the hay, at once fell on its knees and remained there, until St. Anthony told it to get up and eat. The heretic, its owner, was the first to cry out: "I believe in the Real Presence; I am now a Catholic." Many heretics present were also converted. St Anthony continuous worker of miracles pray for us!